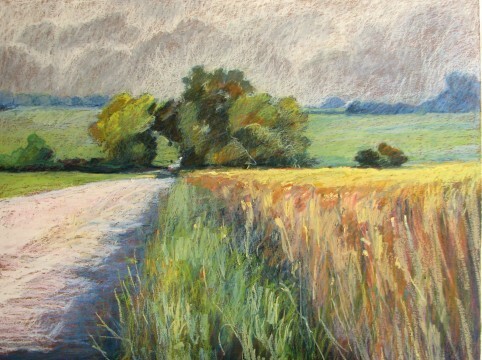 Though I’ve been using oil pastel for almost 20 years, soft pastels aren’t part of my regular kit. So when I noticed a six-class session at the Art Gallery of Hamilton (AGH) taught by pastel artist Clarence Porter, I jumped at the opportunity to experiment. I first saw his exquisite cityscapes of the Hamilton skyline in the spring of 2012 and loved them. 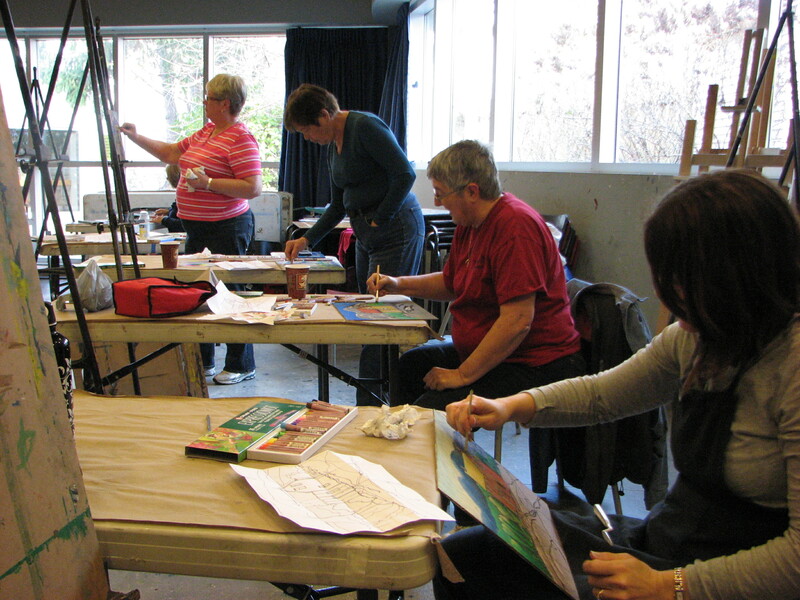 The class was as much fun as Clarence’s colourful paintings. 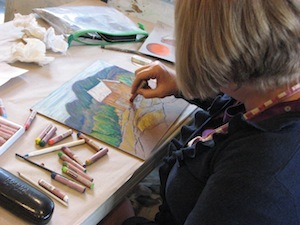 He led us through a variety of techniques and concepts: using sponges to apply and blend colour; the effect of alcohol as a blending/fixing medium; the differences between hard, soft and pan pastels; tips on using a variety of tools from pencils and erasers to palette knives. We experimented with several different surfaces, including paper and board prepared with Golden Pastel Ground, which I also use as a base for oil pastel. My painting, Sheep, hillside was completed during the class. 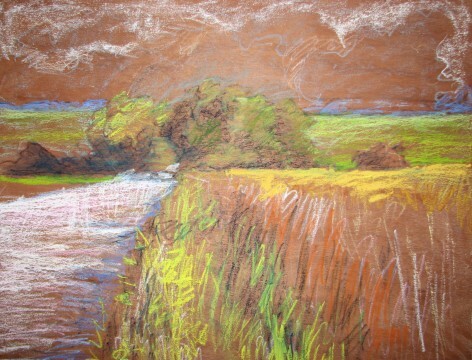 Clarence Porter will be teaching another pastel class from March 24 to May 5 2013, at the AGH. 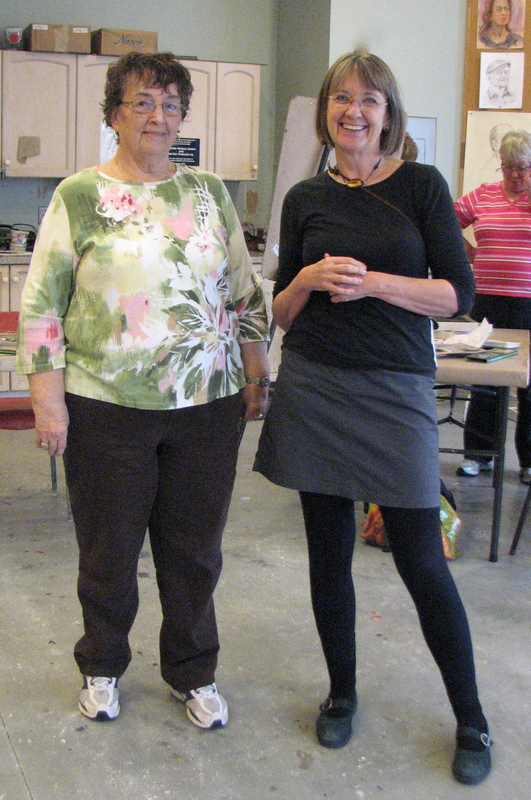 (right, above, with Gail Forbes past president) for an Oil Pastel workshop, held in the wonderful facilities at the Burlington Art Centre. Oil Pastels are a very liberating medium to use: they’re so portable, durable and stable. They appeal especially to people who love to draw and love colour. Using them reminds me of the fun I had as a child when I first made pictures. It is important to understand how colours work together when you’re working in pastel, because you need to blend them and know how to adjust values to get a full range from each hue. So we spent a little time at the beginning reviewing these relationships and weaving additional hues by hatching and feathering, adding black and white, and by blending complementary colours. 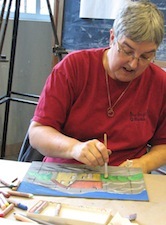 The process gave everyone an opportunity to use their new pastels and try out different approaches to mark-making. We worked on masonite panels that were coated with Golden Acrylic Pastel Ground. The subject for the day’s work was a simplified adaptation of this drawing by A.J. Casson. The youngest member of Canada’s famous Group of Seven painters, Casson spent some of his formative years in Guelph and Hamilton where he took art classes at the Hamilton Technical School. This prolific artist had a particular affection for Southern Ontario villages that could be reached easily on weekend drives from Toronto. Everyone transferred the drawing of this house on a hillside to their panel – with some lovely results. 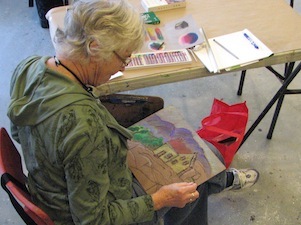 At the end of the day, we had a look at the pastel paintings our group produced. It is always fascinating to see how artists express their own personality to produce unique variations on a theme. Many thanks to BFAA for this invitation and the very warm welcome the members extended. 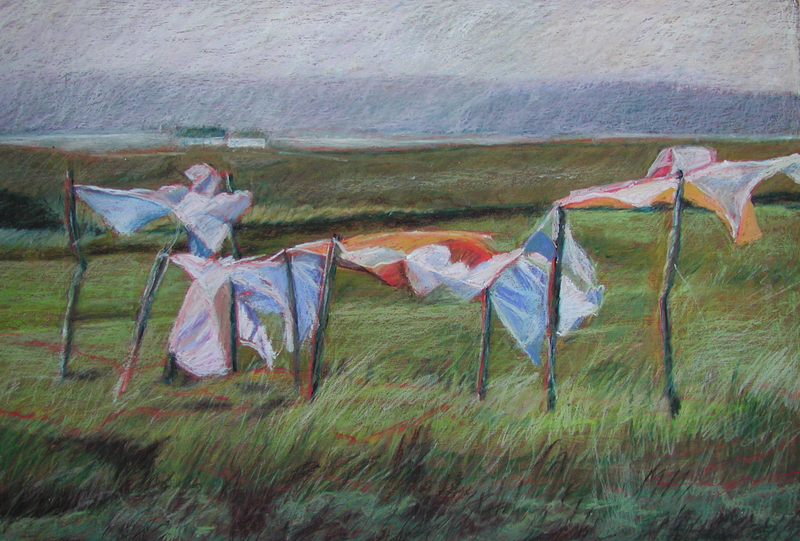 My painting Wash Day Co. Kerry is part of the Hamilton Artists Inc. Annual Members Show, that opened last night and runs until December 16. The Artists Inc. Gallery is located at 155 James Street North, at the corner of James and Cannon Streets in Hamilton. 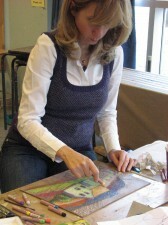 Over 100 artists are represented in this year’s show. It’s open tonight for the James Street North Art Crawl, or you can drop by during the regular hours: Wednesday to Friday 12 pm – 5 pm, Saturday and Sunday 12 pm – 4 pm. 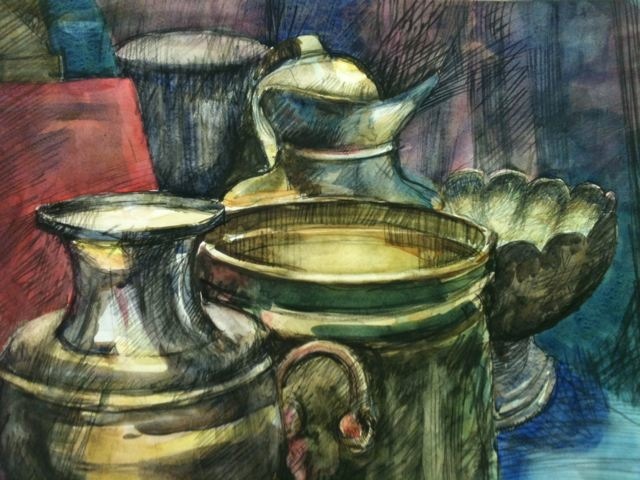 I began by drawing in the major shapes and blocking in patches of colour. 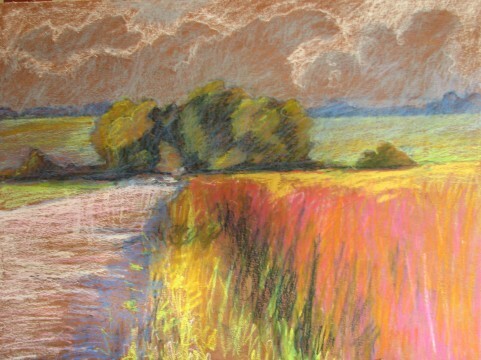 At step two, below, I emphasized the orange/pink glow where the sun shines on and through the wheat stalks. By the third stage, I have worked into the shapes with more colour – building layers with my Sennelier Oil Pastel sticks and Sakura Cray-Pas Specialist Oil Pastel sticks, while also scratching into the surface with a palette knife and a bamboo skewer. 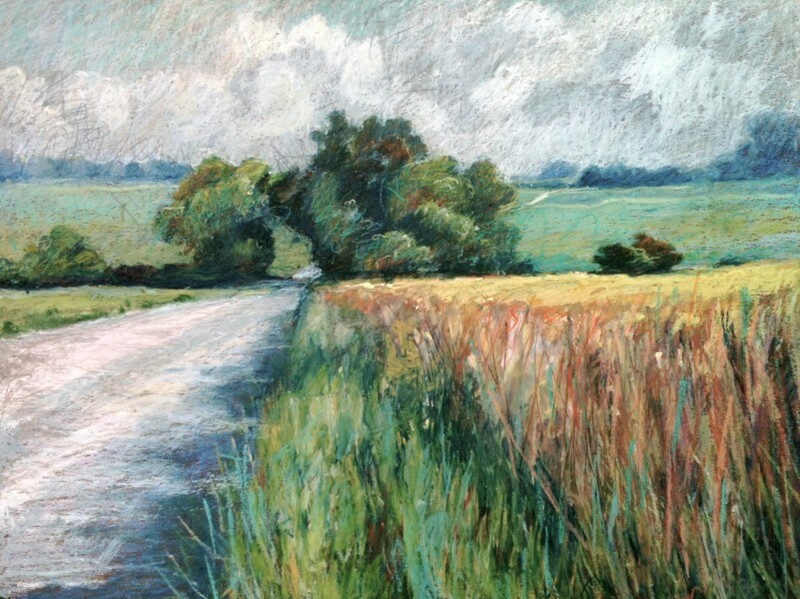 I find that by using different brands of pastel I can manipulate the texture and colour better. I also use oil pastels made by Holbein and Caran D’Ache. 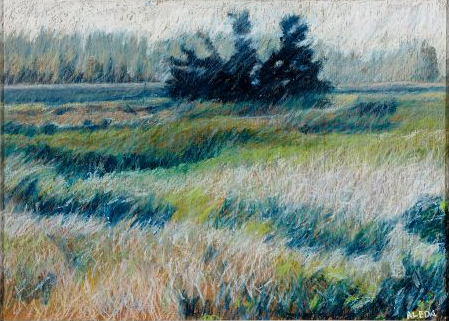 Finally, I refined the surface, added more colour in the sky, defined the shapes and shadows of the willows and added additional contrasting complimentary marks throughout, but especially in the foreground wheatfield. Notice the distant roadway as well – a last-minute addition. 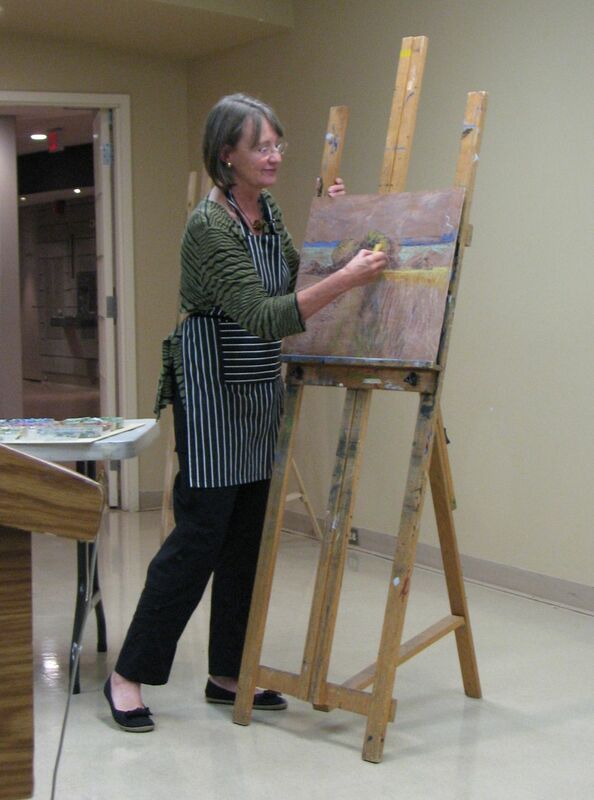 I was the guest speaker for the Burlington Fine Arts Association this week – an exciting first for me. I am so grateful to Victoria Pearce for inviting me to talk about this rewarding medium and to the Association members for their warm response to my work. I briefly discussed the origin and history of oil pastels, the artists who have inspired and influenced my work, and demonstrated my set-up and materials. As you can see I started a new pastel painting and I’ll post the finished work when it’s done. The event was held at the Burlington Art Centre, a wonderful facility not far from our new home in Hamilton. 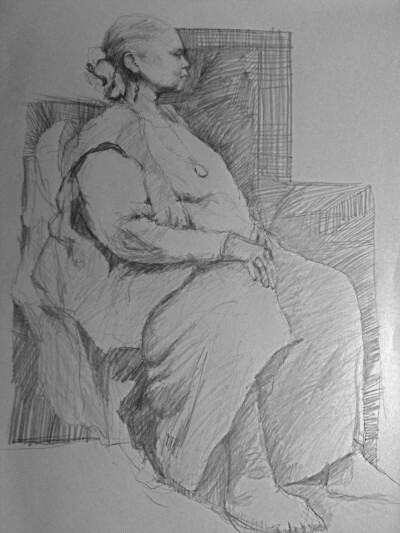 Graphite on paper 18" x 24"
Works by participants in the weekly Sketch Group are on display in the Heliconian Club at 35 Hazelton Avenue in Toronto’s Yorkville, until March 7. “Majesty,” my drawing of actress Sandi Ross, is part of the exhibit. The Heliconian Club generously opens its hall for life-drawing sessions on Mondays for members but also welcomes non-members. The morning session features short poses from 10 a.m. until noon. From 1 p.m. until 3 p.m., the model holds a sustained pose. If you’re interested in drawing with the group, just show up with your chosen drawing materials at 9:45. Some drawing boards and a few easels are provided, but bring your own to be sure you are comfortable. Fees are $7 for the morning and another $7 for the afternoon.